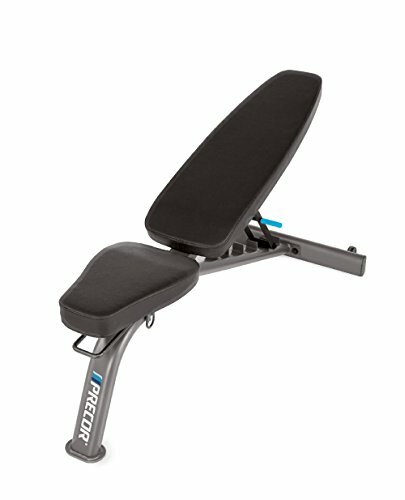 Add variety to your workout routine with Precor adjustable home bench. With six different angles of adjustment, the bench allows you to customize your workouts, focusing on your upper and lower body or core. The bench is also comfortable and supportive, with black vinyl upholstery that sits over contour foam padding. Moving the bench couldn't be easier thanks to the bottom transport wheels and user-friendly handles. Made of powder-coated steel for durability, the bench measures 25 by 17 by 53 inches (W x H x D) when flat and weighs 55 pounds. It carries the following warranties: Lifetime on the frame, 10 years on parts and wear items, and one year on Labor. If you have any questions about this product by Precor, contact us by completing and submitting the form below. If you are looking for a specif part number, please include it with your message.